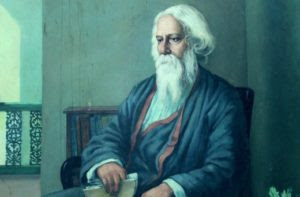 Tagore was concerned with the relationship between the local, such as Bengali culture which needed revitalization and deepening and the universal — the quest for a new humanism. We see this process in his concern with education and in his correspondence with the Italian educator Maria Montessori, who was living in India during the Second World War. Maria Montessori (1870-1952), who became the first female M.D. in Italy in 1896, developed her educational insights through work with neglected and retarded children. She developed a system to help children distinguish letters, geometric shapes, colors through tactile materials. The children were allowed to move freely in the classroom and to progress at their own pace. She introduced new elements into the curriculum that related closely to the daily life of the child, such a gardening, gymnastics, tending plants and animals, preparing and serving a communal meal. Tagore and Montessori met in Italy in 1926 and always remained in touch. In 1934, the Fascist government of Mussolini closed the Montessori schools in Italy as did Hitler in Germany and then in Austria when Hitler’s troops moved into Vienna. Creative thinking among children is seen as a danger by dictatorships — no doubt correctly.